This was a tough week. I unhappily bid farewell to a friend who was always entertaining, full of light and had an uncanny knack of drawing me in. Naively, perhaps, I thought our relationship would last forever. So I am still in denial that things are over. My sadness is tinged with a bit of indignation. What does this say about our culture that a well-respected, successful, forward-thinking corporation that sells BOOKS has sputtered and run out of steam? Was this a long time coming, or did I ignore the signs of malaise? Was the writing on the wall, as it were, when mom and pop bookshops collapsed one by one like stricken toy soldiers? We mourned the end of that era but understood the economics. Rising coats, competition, we got it. But not big, strong, iconic Borders?? 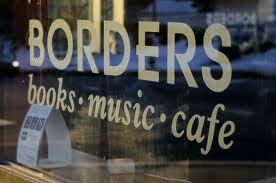 Does Borders’ demise sound the death knell for the few bookstores that remain? For the record, let me disclose that yes, I do order books online. Amazon is easy and efficient, and the free shipping is enticing. But it is simply not the same experience. Will the next generation of readers, the multi-tasking, attention-challenged, sensation-hungry demographic that it is, ever while away a couple of hours on a Saturday afternoon at the neighborhood bookstore? Will our grandchildren yawn when we describe the art of browsing bookshelves with heads tilted 45 degrees, contentedly shuffling sideways as we perused new titles and old favorites? Will they roll their eyes when we wax rhapsodic about the joy of selecting a book and rifling through its pages? You can’t take your kids to Amazon and let them roam free in the children’s section while you nose around the cookbook stacks and your husband gets absorbed listening to tracks of new releases in the music section. Same goes for story hour, author appearances and girl scouts cookie sales by the front door. Borders was my go to store more than any other. I caught up friends over a cup of coffee. As an alumni admissions interviewer for my alma mater, I sat with prospective students in the comfy armchairs. If I needed to buy gifts, Borders afforded one stop shopping, with free gift wrap, no less. Best of all, though, was the idle time spent looking and savoring, and often discovering literary gems just by happenstance. I can accept that popular reading devices, like the Kindle, are rapidly usurping the hard copy book. I can acknowledge that newspapers and magazines are shrinking, if not disappearing, and books are being eschewed as pre-millennial. Even our libraries are reducing their inventory in favor of the electronic variety. But not having Borders … well, that borders on crazy. And now let me get back to my book.